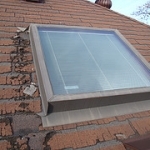 Skylights fail for many reasons including improper flashing at installation. Flashing is often made of aluminum or other weather durable material and runs around the skylight itself. If the skylight is builders-grade product or is more than 15 years old, we recommended replacement with your new roof. When a skylight fails, it can cause a great deal of damage to a house. Condensation rises with hot air causing moisture to get trapped around the window of old skylights. This moisture may drip down onto expensive furnishings and household belongings, as well as leak into the surrounding roof. Eventually, the roof stability may become weakened if the damage goes unnoticed. Don’t let a damaged skylight darken your day, contact us today to schedule a FREE skylight replacement assessment. Need a FREE roof assessment? Have a general roofing question? Complete the form below. We will reply promptly.